I don’t know whether it’s the promise of chocolate for the next 23 days, or that an enticing array of bags and boxes filled with shiny, sparkly things have been brought out of the attic, but Bubs has gone completely potty about Christmas. Yesterday we watched Beethoven’s Christmas Adventure three times in a row and to be honest I couldn’t really grumble as I was just happy it wasn’t Frozen! Jangle all the way home! Me play in the snow! …sung at the top of her lungs whenever there is even the vaguest glimmer of an audience. No amount of correcting her will get her to sing the right words, so we have Jangle Balls and Yeti Go (I’m picturing Big Foot getting his marching orders) and a whole heap of festive cheer. Needless to say if Bubs wasn’t Crimbo Crazy before, she caught a hefty dose of Tinselitis the moment I brought out our collection of Christmas books. We have quite a few, as you’ll see in upcoming posts, but our favourites are the compilations. 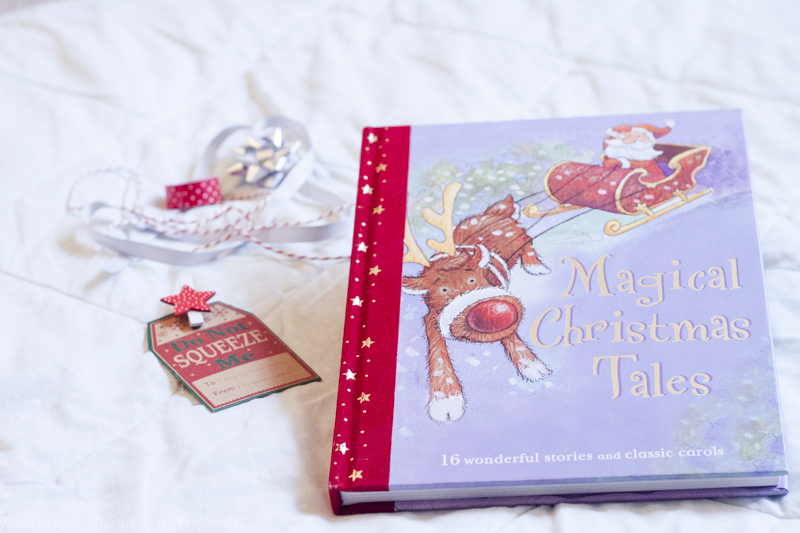 Magical Christmas Tales** is an enchanting mix of festive stories and carols. In the first story we meet the miserly and cantankerous Mr Squirrel who has cancelled Christmas, then we go on a magical sleigh ride and finally settle down for Clement C. Moore’s wonderful The Night Before Christmas, with lots of delightful tales and carols in between. The carols are great if, like me, you struggle to remember the words beyond the first verse of most of them. I’m a little late to the linky party today (Toddler tantrums! Argh!) so I’ve been able to sneak a peek at what Carie and her family have been reading. It looks like they’ve been hit by the Christmas book bug too. If you’d like to share what you’ve been reading then pop over to Carie’s blog and join in. **The link points to an edition that has a different cover but I believe it’s the same book. You could start out with some board books like we did. We have That’s not my Reindeer, That’s not my Santa and Merry Christmas and Bubs still loves them.